“L.A. Story” is a lighthearted romantic fantasy-comedy that stars Martin, who also wrote the script, as a man who lives in L.A. and learns to start small and work his way up to something big and better, if only he keeps an open mind. He first starts on his journey to find that special something when his car suddenly stops on the freeway and he finds himself near a magic giant electrical traffic warning billboard that actually talks to Martin through lettering and tells him that he can improve his life. When we first meet Martin’s character—a weatherman named Harris K. Telemacher—he seems like he could use a change. He’s stuck doing the goofy weather reports that have little to do with actually stating the weather; he has a snobby girlfriend (Marilu Henner), who walks all over Telemacher and apparently will never open a car door for herself and always has Telemacher open it for her; and he finds himself in the midst of a lifestyle that many successful people follow, which is sitting in the sunshine and ordering cappuccinos (with lemon twists for some). So when he encounters this magical sign that gives him a riddle to solve about his life, he keeps an open mind and decides to see what’s in store for him. For starters, there’s a ditzy Valley Girl named Sandee (Sarah Jessica Parker) who works at a clothing store and spells her name “SanDeE*.” She’s an incredibly bouncy, carefree, like-totally energetic chick who is a lot of fun to be around and she and Telemacher share an interesting, energetic relationship. But there’s someone else out there for him—an attractive British journalist named Sara (Victoria Tennant), who is in town to do a story on L.A. lifestyles. Telemacher believes she might be the right one for him. But the problem is, she’s already seeing someone. But hey, when has that ever stopped anybody in a romantic comedy? With the sweet, romantic stuff aside, there are a lot of big laughs to be had throughout “L.A. Story.” Most of them have to do with the exaggerated lifestyles of people in Los Angeles. Everything is so eccentric, you have to wonder when everything is going to stop. Highlights include—Telemacher driving his car to work on sidewalks and through backyards (as neighbors smile and wave as he passes); a magnet gone awry in Telemacher’s weatherman job; people acting casually during an earthquake, except for Sara who is unnerved by this occurrence; the snobby materialism of Telemacher’s ex-girlfriend; and Telemacher realizing that the first day of spring means it’s “open season” on the expressway, and loading a gun before bullets start flying early. There are plenty of jokes like that, most of them very funny stuff. Even in the romantic elements, there’s something to look to and laugh at—for example, when Telemacher and Sandee wander the streets at night, a robber with a gun politely says, “Hi, I’ll be your robber for the evening,” and Telemacher just gives him his wallet like that! The only problem I have with “L.A. Story” is that most of this energetic comedy doesn’t quite mesh well with the “fantasy” aspects. It sometimes feels like we’re in two different movies, except of course for those occasions where we’re laughing at the billboard sign’s pieces of advice. The final act is when everything finally pays off, and luckily, when we really feel the mood that the movie is attempting to convey, and the Capra-esque ending is underway, the laughs come back and we’re satisfied. 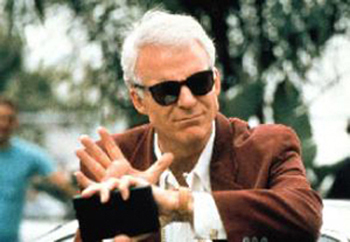 Steve Martin is good as always—sharing a great gift of mixing comedy with sincerity. But he also displays real chemistry with Victoria Tennant, who is just lovely as Sara (I really shouldn’t be surprised since the two were married during production). The real pleasant surprise of the cast is Sarah Jessica Parker, who is simply hilarious and plays the Valley Girl down to a T.
“L.A. Story” has its inconsistencies, but it has enough material to make us smile and laugh. Martin proves again to be a game comic actor and writer, the romance is rather touching, and the screenplay contains plenty of jokes, most of which very funny. And there’s a lot of Los Angeles to take in from this movie. I hope to vacation there sometime. 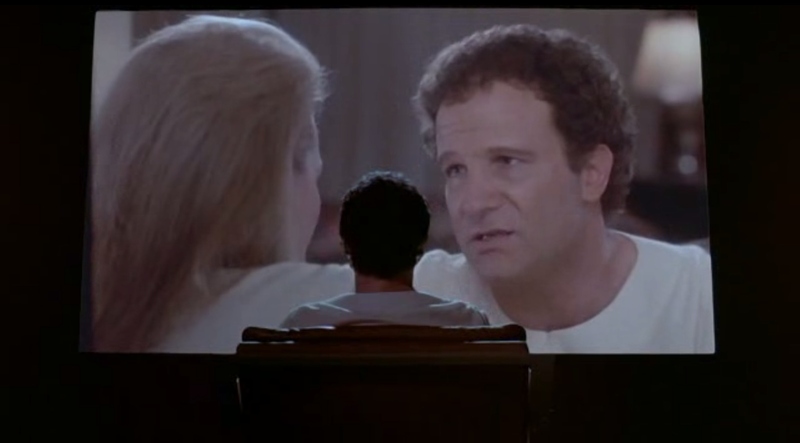 Everybody has their own visions of it, and Albert Brooks decides to share his vision in a film he wrote, directed, and starred in called “Defending Your Life,” a film with wonderful ideas about life after death. You see, apparently there is no heaven or hell (although there isn’t the decision that there isn’t a God). There is only Judgment City. And what a place it is. This city could just be heaven, though nobody wants to admit it. It makes you smarter the longer you stay there and it has the best-tasting foods you could imagine. And get this—apparently, you can eat as much as you want and never gain one ounce of weight. The restaurants are all-you-can-eat. Its one downside—a lackluster comedy club. Well, there’s another downside. If you’re a Little Brain (which residents call those who have just died and came here), then you have to “defend your life.” It’s like being put on trial for your fears in life on Earth. 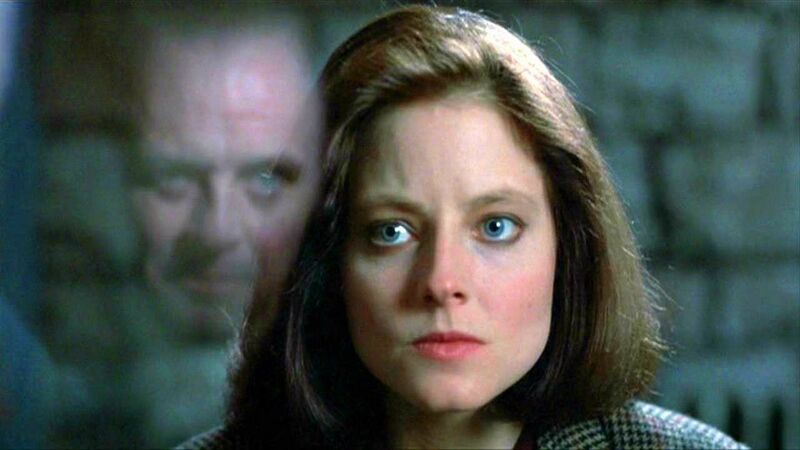 It’s explained that because people use so little of their brains, their lives function mainly on fear. If the Judgment court has decided that you’ve conquered your fears, then you get to stay in Judgment City and become as smart as them. Otherwise, you’re sent back to Earth as a reincarnation to try again to get past fear. Daniel has a defense attorney, Bob Diamond (Rip Torn), who explains all of this to him. He is called into a room where Diamond defends against a tough prosecutor (Lee Grant), as we see flashbacks of Daniel’s life. The court uses these clips to show whether Daniel has fear or just dignity, and Daniel gets chances to explain himself. This is an inventive premise and there are many delights in how it’s all played out. But “Defending Your Life” is also a love story. Daniel roams around the city and meets a wonderful, sweet woman named Julia, who has a smile and manner that only Meryl Streep can deliver. Indeed, Streep plays Julia and her romance with Daniel is beautifully handled. They have warm conversations and enjoy each other’s company—a very sweet romance. The ending of “Defending Your Life” is dramatically satisfying with the right emotional payoff. “Defending Your Life” is a success in fantasy mixed with romance. 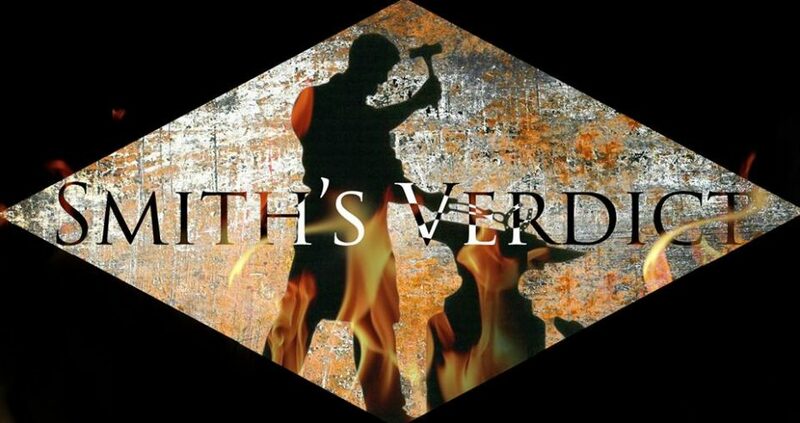 It has an inventive premise that delivers on its product and just got more intriguing as it went along. Now here’s something strange—we have a parody film called “Hot Shots!” that mostly lampoons elements from a movie I didn’t like, which was “Top Gun,” and I liked this parody. Weird, how I’d prefer this ridiculous but often very funny film over the movie it borrows elements from, which had great-looking dogfights, but a boring human story. Maybe the filmmakers of “Hot Shots!” knew that some people felt that way, and made fun of that material and more. But whatever they did, it worked for me. Charlie Sheen plays (and plays with) the Tom Cruise role in “Top Gun” for “Hot Shots!” and his poker face makes him right for the role of Topper Harley. Whenever people look at him, he just likes to show how tough he is by tightening his lip and keeping his eyes open. But when he isn’t trying to act tough, he’s just a macho buffoon, like he’s supposed to be in a film that is like films such as “Airplane,” “Naked Gun,” and not to mention “Top Secret.” These films are funny by giving us silly humor that makes us laugh rather than roll our eyes. 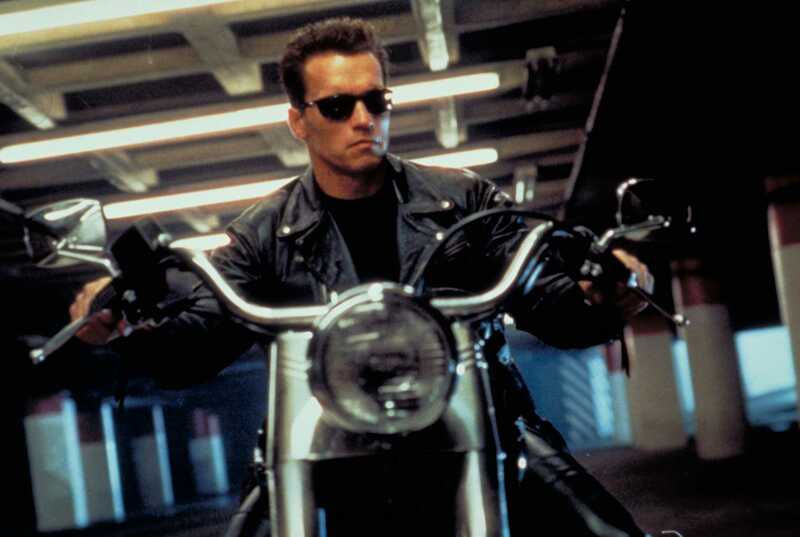 In fact, some of the filmmakers of this film also made “Airplane” and the “Naked Gun” movies. 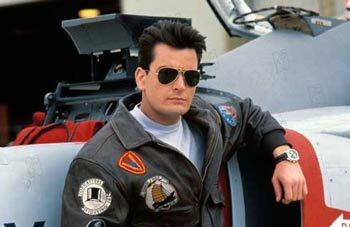 You can’t stop yourself from laughing at a good joke and there are plenty in “Hot Shots!”—most notably, a scene in the beginning of the film in which Sheen, playing a young test pilot, passes by an attractive woman on horseback on his way to the air base and he copies her movements on his own motorcycle. That is truly hilarious and we would expect him to bump into a tree branch or fall off or run into that old comedy cliché of someone being distracted and then running into something, killing the infatuation. But he doesn’t and thank goodness he doesn’t—that joke of running into something while distracted is too old to be funny anymore. Another good running gag is the vision of one of the test pilots, played by Jon Cryer—his vision is distorted by a bad case of “wall-eye.” He keeps missing something he reaches for. That is all I wish to say about this movie, other than the fact that I laughed a lot during this movie. There are some parody scenes that aren’t that funny, but the funniest moments are when we’re caught by surprise. There are plenty of those moments in “Hot Shots!” We also get strong supporting, comedic work by Lloyd Bridges and Cary Elwes, not to mention as much work as we can get in a movie like this from beautiful Italian actress Valeria Golino as the love interest. But like I said, Charlie Sheen’s poker face will make you laugh. How can I knock an action-thriller with good acting, great cinematography, intense action sequences, and an overall energetic, “go-for-it” spirit? “Toy Soldiers” has all of that. The action is well-staged, the acting is decent, the instrumental music score helps give the film its energy. But the main problem is that it’s utterly predictable and gives us nothing new. It’s the screenplay that really sinks “Toy Soldiers.” It’s as if a computer wrote this on a special sort of software that automatically creates screenplays—it’s written entirely in standard clichés. Here’s the story. A Colombian terrorist’s drug-kingpin father is held by American government, and so he and his band of desperadoes, armed with dozens of explosives and weapons, take over a boarding school and make ransom demands. This boarding school is the home of the sons of some of the most powerful people in America—most of them are troublemakers. A small group of the students come up with a daring plan to outwit their captors. Actually, the setup is interesting and the premise could make for a fun action movie, given the right talents in pre-production. But like “Red Dawn,” a film similar to this, the whole movie comes off as mechanical. Everything feels familiar in “Toy Soldiers.” The kids’ joking-around in the opening scenes is mechanical, the authorities all act like they’ve seen countless other action movies and react the same way these sort of characters do, and the action feels like we’ve seen it all before in better movies. And do I even need to say who plays an army sergeant? No, because I already know you’re thinking of R. Lee Ermey. The actors do their best, but even they’re let down by the script. And they are very talented actors. Louis Gossett, Jr. is the school dean who aids the FBI in a raid, Denholm Elliott is the kindly headmaster who tries to calm down the students (he even gives a history lesson in the quad, where they’re all being held), and as the kids, we have young actors Sean Astin, Wil Wheaton, and Keith Coogan, along with newcomers T.E. Russell, George Perez, and Shawn Phelan. The only character that’s interesting in this movie is the head terrorist Luis Cali, played by Andrew Divoff. Although to be fair, I think that’s because villains are usually the more interesting characters in action movies. Being a screenwriter myself, I wish I could’ve gone back in time and wrote the entire script from scratch and handed in my own draft. I would have kept the actors, the director, and cinematographer. I just would have given crisper dialogue, added a little more satirical wit, and just gave the young heroes more to do. A good movie could have been made here. “Toy Soldiers” wasn’t it. Steven Spielberg’s “Hook” is the answer to the question, “What if Peter Pan grew up?” And who better than Spielberg to make it, since he specializes in fantasy and practically has the gift of eternal youth? And while there are some neat, interesting parts in “Hook,” Spielberg unfortunately relies on art direction and “whimsy” clichés to tell a compelling story. Half of the movie is good and half of it is…not. Peter takes his wife Moira (Caroline Goodall) and kids to London to visit Granny Wendy (Maggie Smith), who adopted Peter when he was an orphan child. The kids sleep in the same room where the original “Peter Pan” story took place. (Starting to see a connection here?) But that night, the kids are visited by one of Spielberg’s visual trademarks—the strange, blinding light and smoke outside the window. When Peter, Moira, and Granny Wendy go up to investigate, the children are gone, with a kidnap note left behind by the villainous pirate Captain James Hook. It’s then that Granny Wendy asks Peter, “Don’t you remember who you are?” She also says it’s time to return to Neverland. Anyway, we meet Hook (Dustin Hoffman), his sidekick Smee (Bob Hoskins), and his band of “scurvy” pirates. 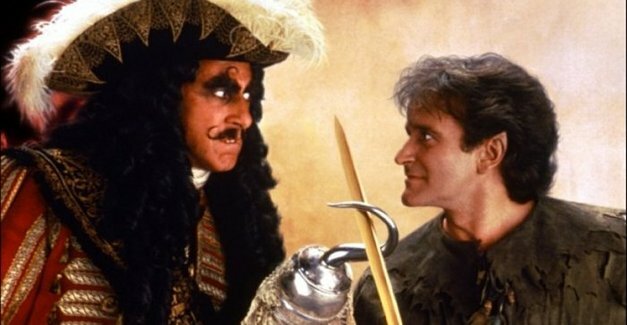 Hook demands a new war between the pirates and Peter Pan. But seeing as how Peter Pan has grown up and forgotten to fly, it seems pointless. He still keeps the children held prisoner, and so Peter must learn to get back to his original form. What do I like about the movie? To begin with, I like most of the key actors. Robin Williams is believable as Peter Banning and strangely, equally credible when he’s playing Peter Pan (when he’s not completely obnoxious). Dustin Hoffman is a hoot as Hook. He chews the scenery and treats every one of his scenes with pleasure. He’s fun to watch. Bob Hoskins has a few funny moments as Smee, and Maggie Smith is sweet as Granny Wendy. I love the setup to the story. It shows a great deal of promise. It’s nice to see the “Peter Pan” in-jokes that make “Hook” feel like a legitimate sequel to “Peter Pan.” And there are some neat little arrangements that I really enjoyed, such as Peter asking his son when he’s going to stop acting like a child. He is a child and Peter must become one to save him. There were some really funny moments among the pirates, including a “scurvy” cameo by Glenn Close who is sent to a trunk full of scorpions as punishment for not agreeing with Hook. What I didn’t like about the film, aside from the art direction, were the scenes of strained whimsy, such as when Peter’s daughter sing as schmaltzy little tune that Spielberg thinks is cute enough to be magical, when it’s really forced. Also, the moments in which Peter realizes his own true identity is hurt by many plot holes in Peter Pan’s back story—for example, if he went to Neverland as a baby so he’d never grow up, then why did he grow to be 12 years old? The final climax is obligatory and leads to many false endings. I’m really tired of these false endings; they slow things down and don’t amount to much, other than just stalling so that the hero can have more chances to defeat the villain. To tell the truth, it’s the final half of “Hook” that lets the movie down. The first half actually has its clever moments with an intriguing setup and a likeable feel, not to mention game performances by Williams and Hoffman. But “Hook” is much ado about nothing. Maybe if Spielberg actually made his own retelling of the original “Peter Pan” story, we’d have something better. But as it is, it’s ambitious, but cluttered.